Hand to God, these earrings might just get you entry to heaven. Part of the collaboration between Doodad and Fandango with Sydney tattoo artist Sarah K, these doodads are inspired by traditional tattoo art with a kitschy twist. Measuring approximately 12cm high by 4cm wide (including the top heart stud bit), these are quite long but only moderately heavy and feature red ‘blood’ drips hanging from the fingertips. 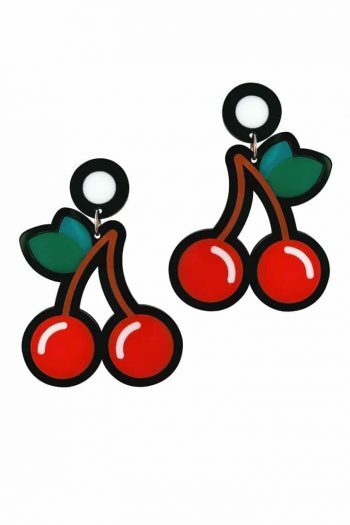 Pop art earrings designed and made by Nikita Margarita for her label Doodad And Fandango. Made from hard wearing acrylic perspex and meticulously inlaid. These bold costume jewels are a great match for all kinds of outfits and look especially fantastic with a Gloria Turban. Each pair of Doodad and Fandango earrings come packaged in a gorgeous glossy black card boxes, and are perfect for presents.